Karpenko Physico-Mechanical Institute of National Academy of Sciences of Ukraine, Lviv, Ukraine. Results of experimental estimation of lacquer-paint coatings adhesion strength by the ultrasonic nondestructive method on the basis of measuring of the ultrasonic Rayleigh surface wave spread velocity and attenuation are represented. For adhesion strength mapping on the product surface the computerized tomography method have been proposed. Physical and information technologies and facilities for tomographic reconstruction of the adhesion strength spatial distribution on the basis of Rayleigh waves parameters measuring in the different directions at the beam scheme of data collection have been developed, experimentally examined and realized in the ultrasonic tomograph for material characterization UST-2000. Defense of facilities and structures from corrosion by help of the think protective coatings, type of lacquer-paint or polymeric (LPC), is wide-spreaded in practice. Estimation of coating quality is very important for increase of its' exploitation period. The information parameter of coating quality is adhesion strength (AS), characterized durability of connection between a coating and a substrate. The zero-adhesion coating ranges (peelings) contribute to substrate corrosion and coating destruction. Therefore, detecting of the coating ranges with weak adhesion will allow to estimate the coating predefective state. Now AS estimation is being carried out only by the destructive methods. Experimental investigations have showed that AS was being changed on the product surface essentially. The problem of nondestructive testing (NDT) of the coatings AS spatial distribution (SD), i.e. NDT AS mapping, has not been enough investigated and solved at present time. Coating AS is being characterized by the mechanical parameters. Therefore, the acoustical methods (AM) of this parameter determination, which use the elastic waves is the most adequate for this task solution. In present paper the ultrasonic method, based on reconstruction of the tomographic images of the surface acoustic waves (SAW) spread velocity and attenuation SD, has been proposed and experimentally examined for mapping of the LPC AS SD. Experimental results, presented in paper, confirm that SAW spread velocity and attenuation depends on coating adhesion strength. Ratio of ultrasonic (US) signal amplitudes on the conditional and weak-adhesion coatings ranges may be 10¸30 dB. But different hindrances, in the first turn, the acoustical contact changes at scanning, exert strong influence on the measurements results. Therefore, the informatively redundant method of the ultrasonic computerized tomography (USCT) is the most perspective way of coatings adhesion strength spatial distribution determination. Such approach to LPC AS NDT mapping is being developed in present paper. Experimental results on determining of the phenomenological relations between the SAW informative parameters and LPC AS values, the main data collection sheme and peculiarities of the developed 2D-tomography reconstruction algorithm are presented. This technology have been introduced at development of the ultrasonic computerized tomograph UST-2000, which has the special functional assignment, namely for quantitative estimation of the thin protective coatings (lacquer-painted, polymeric, etc.) AS SD. At scanning on the product surface by the special multichannel US transducer, wich uses radiating and receiving of the surface ultrasonic waves along different directions within circle, the coating ranges with weaked AS are being detected, that allows to diagnose the coating predefective state. Model of the LPC Adhesion Defects. LPC adhesion is a phenomenon, which determines bond formation between a coating and a substrate, on which it has been coated. A conclusion about adhesion is usually made on the basis of adhesion strength, which is being defined as work that should be expended on adhesion bond failure. AS is one of the most important LPC property, which to a great extent defines a protective property of a coating under exploitation conditions. LPC AS is not constant in exploitation. As a rule, it decreases in time due to both an environment effect and mechanical loads. Such behaviour is being caused by chemical or physical processes, taking place in a film, on a film-substrate boundary, and internal ( tangential ) stresses. On the basis of the detailed analysis of features of LPC adhesion to a substrate, the NDT object model in view of the three-layer structure may be taken as a basis at development of the acoustic methods for LPC adhesion NDT. Such three-layer structure is represented in figure 1. Within a scope of this model the non-defect (ideal) LPC structure, as the NDT object includes the non-defect LPC layer 1, very thin adhesion layer 2 and substrate 3. In the first approximation the layer 1 may be considered as homogeneous one along thickness. The layer 1 thickness varies within 10-300 mcm, and it is smaller, than applicable wavelengths of the sounding acoustic waves. The adhesion layer 2 is very inhomogeneous on its nature, but due to very small thickness (one can assume within 10-100 nm) this inhomogenety does not influence on propagation of the acoustic waves even of high frequencies (few MHz). Let's also assume for the mentioned above model, if LPC adhesion to a substrate is good, that the adhesion layer physico-chemical and acoustical characteristics are being determined as average values of the same material characteristics of a substrate and a coating, as this layer is formed in the result of mutual penetration of these materials. The defective LPC structure in the proposed model consists in presense of the very weak LPC adhesion ranges to a substrate, which is being simulated by introducing of the defect region 4 with the characteristic transverse size ld into adhesion layer 2. The physico-chemical and acoustic characteristics of this region are being significantly differed from the same one of the adhesion layer and are being defined by the parameters of an external environment, which has penetrated into the adhesion layer with help of absorption substitution of the adhesive-substance bonds for environment-substance ones. Influence of the interfering factors is very important. They cause the structural noise at realization of the LPC adhesion acoustic NDT methods, deteriorate sensitivity and other parameters of these methods. The following characteristic LPC defect, significantly influence on SAW propagation, especially at high frequencies: craters, cavities, orange peel, waviness, underflow, overflow, lines,cracks, flocculation, exudation, gascous bubbles, punctures etc. These defects characterize the two types of LPC regions and are being classified as the: closed internal regions with a characteristic defect size lid and surface defects with the characteristic defect size lsd (figure 1). Such defects, influencing on SAW propagation during the NDT process, can distort values of the US signal informative parameters at measurement and worsen the NDT acoustical method possibilities. Methodology of LPC Adhesion NDT. areas with the regular AS value, which is being determined by the stated technology parameters and guarantees the full product working resource with high probability. The manufactured diagnostic equipment must deliver control-diagnostic information about the mentioned above areas. More detailed information about product LPC AS is less valuable for estimation the product residual resource. Such methodological approach to the LPC adhesion NDT process leads to the two scientific NDT tasks: detection of the LPC adhesion defects ("LPC-Substrate" peelings) and LPC AS quantitative estimation. method with SAW utilization in a LPC (SAW-C). Among HF SAW methods a positive result has been obtained by use of the Rayleigh SAW (SAW-R method). Below in the table the comparative experimental values of sensibivity (in dB) of the SAW methods are represented. The sensitivity measurements have been carried out on the same testing samples with peelings and amplitude variation of the US signal have been as informative parameter. Three acoustic methods - bottom reflections (BR) method, normal waves damping (NWD) method and velocimetrical (VM) method - have been suggested for adhesion strength nondestructive estimation (NDE). Two samples types have been used for experimental investigations. In some samples the adhesion have been artificially decreased to 3-6 kg/sm2 on separate circular areas with 10-30 mm diameter. The AS measurments have been carried out by the destructive method (mushroom method) on the samples, manufactured by the same technology. The samples substrate thickness was equal 1...12 mm. This samples series was being used for estimation of the SAW methods ability to solve the LPC AS NDE problem and detection of the decreased adhesion areas. The next samples series was being destined for investigation of correlation between AS and the SAW methods informative characteristics. LPC AS in these samples was artificially varied on the whole sample surface. The samples manufacturing technology was being varied for obtaining the various AS values. LPC AS measurments have been carried out in four points on each sample. In this samples series LPC AS was being varied from 2.6 to 28.8 kg/sm2. Method is destined for testing of LPC AS on the sheet products. The transverse wave is radiated in the product from LPC side under some angle and the US signals, reflected from the LPC and substrate bottom are being registered. The signals amplitudes ratio are being used as the information parameter. This method uses the dependence between adhesion layer transparency and LPC AS. The experimental investigations with the first samples series have stated that the BR method detect the areas with artificially decreased LPC adhesion. Variation of such information characteristic as signal ratio A2/A1 was bigger than 8...14 dB. Method sensitivity depends on the US wave type. Dependence of the reflected wave parameters from AS was being observed for the transverse wave only. The fulfilled comparative investigations on different frequencies have fixed the higher method sensitivity for the higher frequencies, more than 5 MHz. The experimental investigations with the second samples series have stated that the BR method may differ the samples according to the LPC AS depending on the absolute value A2/A1. Mainly, according to the measured value A2/A1, the investigated samples may be divided on three groups: with good, average and weak adhesion. The measurements results of correlation between AS and the BR method informative parameters on the samples with essentially different LPC adhesion have been presented on the figure 2,a. Fig 2: The experimantal results of LPC AS measurements on the samples (N2 -N7) with the essentially different LPC AS. This method consists in the next procedure. One of the normal SAW mode is excited in the substrate and its damping is being measured. It has been experimentally established, that the AS decreasing leads to the decreasing of the normal wave damping. The investigations of the "LPC AS-Damping" dependencies have been fulfilled on the samples, already investigated by the BR method. The investigation results have showed that the normal SAW damping is connected with the "LPC-Substrate" AS and that damping are being decreased at decreasing of the AS value, measured on the sample by the destructive method. NWD method sensitivity depends on the SAW frequency. If AS values are changed in range 2.6-28.8 kg/sm2, according to the destructive method, the damping at frequency 4.5 MHz are being varied from 0.1 dB/mm to 1 dB/mm consequently (figure 2,b). Results of the fulfilled investigations state, that the NWD method allows to identify the samples wish good, average and weak adhesion. Figure 2,a and figure 2,b also demonstrate the informative characteristics (A2/A1 ratio and damping) dispersion on the same sample. The NWD method results are in good correlation with the BR method results. Adhesion Strength Mapping by Tomographic Reconstruction. The next stage of development of the stated problem is estimation of the AS spatial distribution on the product surface. This task should solved by the NDT methods, which provide both AS mapping and necessary accuracy of AS determination. Carring out of such requirements may be provided by the ultrasonic computerized tomography methods. Tomographic methods are being differed by the data collection schemes and reconstruction algorithms. At US sounding in the situation, when inhomogeneities have the weak contrast character, the beam data collection scheme and inverse projecting method of tomographic images reconstruction are the most useful. On the figure 3 the data collection scheme, proposed for LPC AS mapping by the USCT method, have been represented. 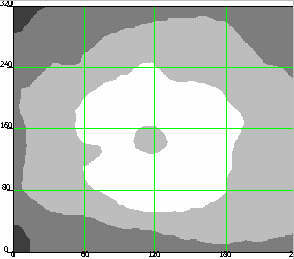 Fig 3: Data collection scheme at tomographic reconstruction of the LPC adhesion strength spatial distribution. data collection scheme - scanning on the product surface by the multichannel radiating-receiving SAW transducers. Practical requirement of LPC AS NDT mapping in real time mode needs the corresponding algorithm of the tomographic reconstruction without complex operations of 2D Fourier transformations and resultants. The developed algorithm of 2D tomographic reconstruction of the AS inhomogeneous SD on the basis of the sum image has two stages and consists in the following. Designation: - operator of inverse projecting (construction of the sum image), - operator of parallel projecting, - parallel projections, which are being obtained on the basis of the sum image, operator of double differentiation of the parallel projections, vector, which determines the projecting direction. where - parallel projections, calculated on the basis of relation (1) on formula . 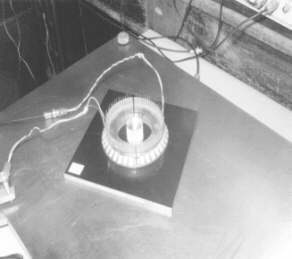 The mentioned above algorithm have been used at development of the experimental model of the ultrasonic computerized tomograph for material characterization UST-2000. Experimental examination was being carried out on the sample with polymeric coating by thickness 0,1 mm and with artificially created AS inhomogeneity. Measurement of the beam projections - spread time and attenuation of the US surface Rayleigh waves in the different directions - was being fulfilled by way of product surface scanning by multichannel (16 channels) tomographic radiating - receiving US transducer. Distance between the radiating and receiving transducers of each transducer pair is equal 180 mm. The acoustical part of the multichannel tomographic transducer and the tomographic image of the relative change of SAW attenuation on product surface (i.e. inhomogeneous AS SD - AS map), reconstructed on the basis of measured projecting data, have been accordingly represented on the figure 4 and figure 5. Fig 4: Acoustical part of the multi-channel tomographic transducer. Fig 5: Reconstructed tomographic map of the SAW (Rayleigh) attenuation spatial distribution on the sample surface with polymeric coating and area of artificially decreased adhesion strength. The experimental tomographic image quality corresponds the artificially created AS inhomogeneity and confirms the principal possibility to determine the thin coatings AS SD by the NDT methods. It is experimentally shown by measurements on the manufactured sample, that AS changes lead to the next Rayleigh SAW informative parameters changes: spread velocity into 0,84% and attentuation into 21%. Now the problem of nondestructive evaluation of the thin coating adhesion strength spatial distribution is not solved. The proposed approaches, using the surface acoustic waves (Rayleigh) for coating sounding and informative technology of 2D ultrasonic computerized tomography for signal processing, have allowed to solve this problem theoretically and experimentally in the first approximation and to develop facilities and methods for practical realization. The present scientific work have been carried out in the Karpenko Physico-Mechanical Institute of NAS of Ukraine and Design Bureau "Pivdenne" in the frame of the Ukraine Science-Technology Center Project # 612.